Reliable and controlled expansion, regardless of the target, every time. 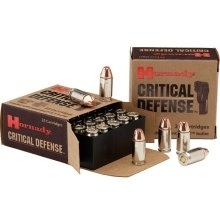 Hornady Critical Defense ammunition is loaded with Hornady's patented Flex Tip bullet. Unlike most hollow point bullets, the Flex Tip bullet features a soft polymer insert that allows for consistent and reliable expansion. Each bullet is custom designed for individual loads and loaded in nickel plated cases to help prevent corrosion. This ammunition is designed by Hornady to expand every single time. This ammunition is new production, non-corrosive, in boxer primed, reloadable brass cases. Muzzle Energy: 249 ft. lbs.